Meter 6mm Wire Binding 34 Ring Supplies are designed for use with any 3:1 Pitch Wire Binding Machine and give a professional touch to your reports, submissions and presentations. 6mm Wire Binding Coils bind up to 30 sheets of paper. 6.4mm Wire Binding Coils 34 Ring are also known as Twin Loop Binding or Wire Binding Combs, and provide strong and permanent binding of documents. When books are bound with wire they lay fully flat when opened and pages can be completely reversed 360 degrees. 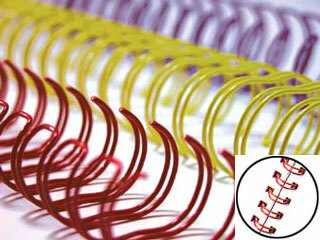 6mm Wire Binding Combs are available in a range of colours, including Black, White, Blue, Red and Silver. Click on the links below for pricing and more information on different Wire Binding Supplies 34 Ring sizes and colours.